Kids love to emulate superheroes. They breathe, eat, drink and sleep their favorite superheroes. They are completely aware of their conduct, their powers, talents, abilities, whose side they are on and their true identity. Superheroes are captivating and they allow kids to unleash their vivid imaginations in role play. Kids can harness invincible powers, do amazing feats and be ready for any battle. They can take on any diabolical antagonist and nefarious villains who dare to step in their path. Ironman is one of the most icon superheroes and kids want to be him. 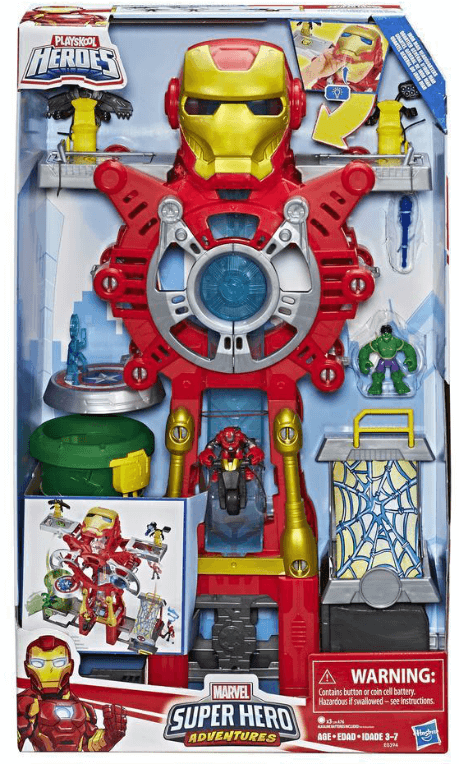 Now they can with the super cool Playskool Heroes Marvel Super Hero Adventures Iron Man Headquarters Playset. Power up the Avengers! 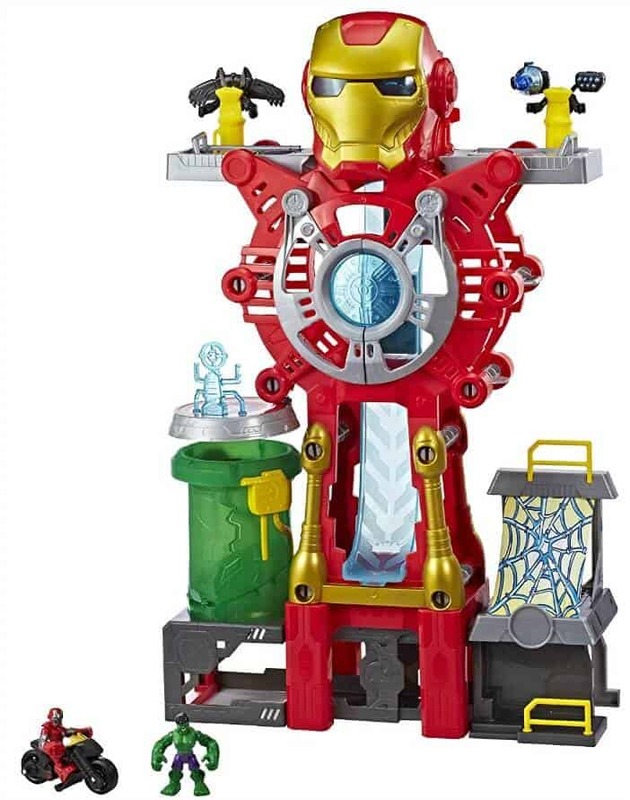 This Playset comes with and Iron Man and Hulk figure, power up arms along with 2 additional sets of power up arms, a motorcycle, one projectile, and a user manual. The Iron Man’s headquarters is huge! It’s a covert location with a personal laboratory where he built his suit and other ridiculously cool gadgets. Both Iron Man and the Hulk figures can fit comfortably on the motorcycle and be placed in strategic places in this headquarters. Their heads, arms and legs move, plus you can remove their arms and snap them on other Avenger figures. And the motorcycle is mobile with moveable wheels. Secret code: heroes. If you lift the face guard on the Headquarters, the chest plates will open and a blue light will flash. If you press the button on his ears, the blue lights will also flash. There is a secret place in the helmet for Iron Man and his motorcycle. Press a lever behind the mask ears and Iron Man on his motorcycle will race down a chute. Awesome! On one side of the headquarters is the Spider Man’s web launcher which acts like a super spring trampoline. Underneath it, he has a digital looking screen that shows where he has to go if help is needed. On the other side is the Hulk’s gamma chamber with an enclosed trap door so he can crash out. Underneath both areas is a free space for hanging out or hiding. Between them is the adjustable motorcycle ramped mentioned earlier. Both sides can be pulled out for a wider play area and pushed back in when finished. Going up a level, and on the left side, you have Captain America’s podium with a spinning shield. Captain Americas does not come with this set, but you can buy him separately. On the very top, there are two more platforms. On one side is the Black Panther, the other side made room for the Black Widow. Kids will have a blast as they jump into action to fight the bad guys with this multifunctional playset. My daughter would love the baby alive! My daughter is a huge my little petshop fan. She has 100’s of them. The cosmic edition would be a great addtion to that! My granddaughter would also like The Baby Alive Super Snacks Snackin Noodles Baby. My niece would love any Littlest Pet Shop toy! The new Baby Alive doll would be well loved by my daughter. Thanks! My son would love Nerf Infinus. The Playskool Heroes Chomp Squad Troopersaurus and Bobby Badge would be awesome for my nephew. Nerf N-Strike Elite Infinus for my grandson. The boys want connect four shots as well as this iron man headquarters was on my 5yr olds list to Santa! I would also love furReal Roarin’ Tyler, the Playful Tiger. The Play Doh Star Wars BB8 set. The Nerf Zombie Strike Dreadbolt would be something my grandsons would love. Would love to get a furReal Munchin’ Rex as it looks like a lot of fun. My sons would love the Nerf Zombie Strike! Thanks for this generous chance! I love the littlest pet shop cosmic pounce collection! I would love to take my kids to my time growing up and get the Play-Doh Buzz ‘n Cut Barber Shop Set! My son would love the Playdough Buzz nCut Barber shop set! She would love the furReal Roarin’ Tyler, the Playful Tiger toy. Beyblade Burst Evolution SwitchStrike Starter Pack Luinor L3 is a nice one. My son is really into Beyblades lately! Play-Doh Treat Without the Sweet Holiday Pack! Ricky the Trick Lovin pup is the one I know is big on a certain wish list! I would like Monopoly Cheaters Edition. Neff toys are always fun. I would love Lost Kitties! My daughter sure would like furReal Ricky, the Trick-Lovin’ Pup! My sons would love the Nerf Zombie Strike! My twin grandchildren love Paw Patrol and Peppa Pig so something along those lines would be fun for them. I would love to win this for my youngest nephew. Thanks. I would also like to gift the “furReal Ricky, the Trick-Lovin’ Pup” to my goddaughter. I would like to have Trivial Pursuit 40th Anniversary Ruby Edition. We love trivia! My grandson would like the Marvel Studios: The First Ten Years Captain America: Civil War Captain America and Crossbones. Let’s Dance Elmo for my grandson Carter. I would also like to have the FurReal Ricky, the Trick-Lovin’ Pup. I would love the Star Wars The Black Series Centerpiece Darth Vader. 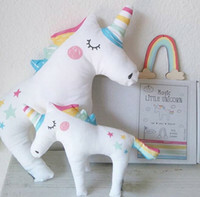 I would love the My Little Pony Rainbow Dash Glitter Design Pony Figure for my niece. The Monopoly Cheaters Edition would be perfect for our family. We’d also like to have Transformers: Generations Power of the Primes Legends Class Beachcomber. The furReal Chatty Charlie, the Barkin’ Beagle would be great for my grandson. I would like the Cranium Game to play with the kids. My granddaughter would love the Littlest Pet Shop Cosmic Pounce. I’d love a copy of Clue! I would love to add more board games for our game nights. Transformer generations would be fun! I would like the Littlest Pet Shop Plush Bobblehead Roxie McTerrier. I would choose the furReal Roarin’ Tyler, the Playful Tiger. So cute! Playskool Heroes Transformers Rescue Bots Flip Racers Optimus Prime to add to his collection! I have a feeling Santa might be bringing it!!! My niece would love aLittlest Pet Shop toy! my daughter would love the My Little Pony the Movie Twilight Sparkle Flip & Flow Seapony Figure. she loves ponies. I’d love to have the Singing Rainbow Dash (MLP). Both my young grandkids, 4 and 6, love LOLs, all of them, any of them.